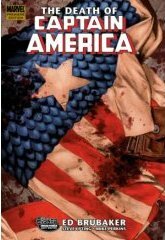 I’d already read Captain America #25, the one that was in the news last year covering the death of Captain America. Maybe I should’ve put a spoiler warning there, but really, it was on all the news channels, and even in the New York Times. This hardcover opens up with issue 25, and has the subsequent five issues as well. Basically, this is Captain America without Captain America. It deals with all the aftermath of his death, the wake, how his friends, and fellow super-heroes are dealing with the tragedy. I’m currently on issue 27, with Bucky trying to reclaim a certain item being held in custody. I’ve heard that many people feel the Captain America series got a lot better after Steve Rogers died. While these stories are entertaining, and I’m intrigued with where things are going with it, I’m not interested enough to read it outside of the trades, and those when they are available by the library. This entry was posted by jason	on Thursday, June 5th, 2008 at 10:25 am and is filed under Marvel, TPBs/graphic novels. You can follow any responses to this entry through the RSS 2.0 feed. You can leave a response, or trackback from your own site.